Construction of this elegant 2-storey building began in 1833. 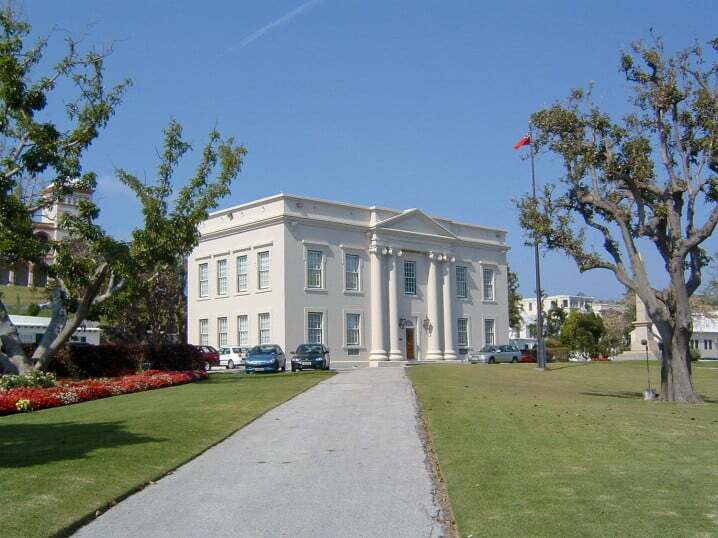 On weekdays visitors are welcome to look at the room where Bermuda’s Senate holds it meetings. The Senate convenes on Wednesdays at 10 am (Nov – Jul) and the sessions are open to the public. The Premier’s office and those of some top civil servants are also situated here. On the first Friday in November the spacious lawn is the setting for the ceremony marking the reconvening of Bermuda’s parliament. The governor, sitting in a 17th century chair, reads out the Throne Speech, outlining the intended policies of the incumbent government. The Cenotaph lies just south of the building and honours Bermudian soldiers killed in World War I and II. The limestone monument is a replica of the one in London. A moving service is held here on Remembrance Day. Recent years have seen other monuments erected in the grounds here. In 2009 a statue of Sally Basset was unveiled as part of the island’s 400th anniversary. In 1730, the elderly slave stood trial at the State House in St George on charges of poisoning her granddaughter’s owners. She was found guilty and sentenced to death by burning, a horrific punishment even by the standards of that time. The bronze statue, by Bermudian sculptor Carlos Dowling, stands near the western entrance gate of the Cabinet Office. Interpretative plaques tell her story. Over at the eastern entrance there’s a memorial to the island’s war veterans. The names of thousands of Bermudians who served in the World Wars are listed on five granite slabs, arranged in a semi-circle around a fountain. It was erected in 2010. The Cabinet Office is situated on Front Street in Hamilton, within easy walking distance of both the bus station and the ferry terminal. Sessions House is just north. Map showing location of Cabinet Building.